It’s the first of December, my advent calender has been opened and eaten and a morning browse through my Google reader reminded me that it was also the day for the delightful Sweet and Simple Bakes to be posted. This was another Sweet and Simple bake I just couldn’t bear to miss, snow flecked brownies from the one and only Nigella Lawson. I’ve made these decedent treats many times before but I’m always looking for an excuse to bake up a fresh batch! I love how they look with a delicate dusting of icing sugar settled upon the crispy crust, doesn’t it just look like Christmas? Check out the Sweet and Simple Bakes homepage from the 2nd December for everyone elses brownies. wow. This is my first time visiting your blog and I just have to say, everything looks delicious! This is not good for me right now since I am on a diet! The holidays are a bad time to try and lose weight! I will dream about your beautiful treats! Popped in to say hi! I love your blog! That little dusting of icing sugar makes them look so festive. I loved this recipe!! Your brownies look yummy, too! I love the dusting of the icing sugar over the top. After the mess I made making them I decided not to risk throwing icing sugar all over my kitchen! Katie ,ur brownies look yummy,as am hopping by i'm so missing popping a brownie -they were absolutely delicious werent they?thanx,i love to experiment! Oh wow! They SO look like Christmas. Yummy and Great Job! I agree. The powdered sugar makes them look like they belong on a Christmas cookie platter! 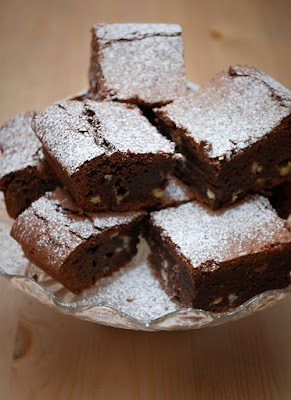 Great brownies and cute blog! KAtie,just got round to browsing thru ur blog & loved it-ur cookies are so lovely.Simply have to follow ur blog right away but blogger aint co-operating as usal.Am going to end up bookmarking quite a bit am sure-lovely!!!!! Lovely! You should hook your post up to I Heart Cooking Clubs. We are doing Goddess Goodies this week (Nigella), these would be perfect! Glad I'm now able to access your blog – had no success last month when I tried. Hadn't realised these were a Nigella recipe, so that was good to know. Yours look lovely.